Aw, the first run of the new dark matter detector LUX was a disappointment. Alas, that is how science goes. Sometimes, you find nothing. It still has over two years to go, though, so my fingers are crossed for something to be found. And no, even if no WIMP (the dark matter candidate) is found, MOND is not it. The Bullet Cluster shot that theory dead and it is now a corpse in the graveyard of scientific ideas. Last post, I finished the post cryptically, mentioning that there is a certain path that an object falling will take less time to travel than any other. 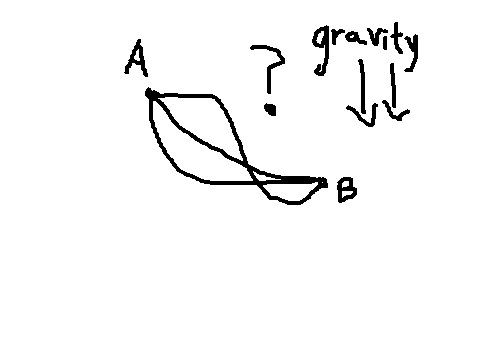 Now, one of the solutions, as I mentioned, is just a straight fall. That is only one of the solutions, but only if the endpoint is directly underneath the starting point. What if the endpoint is to the side, what curve would the fastest path follow? You are currently browsing the IBY's Island Universe blog archives for October, 2013.